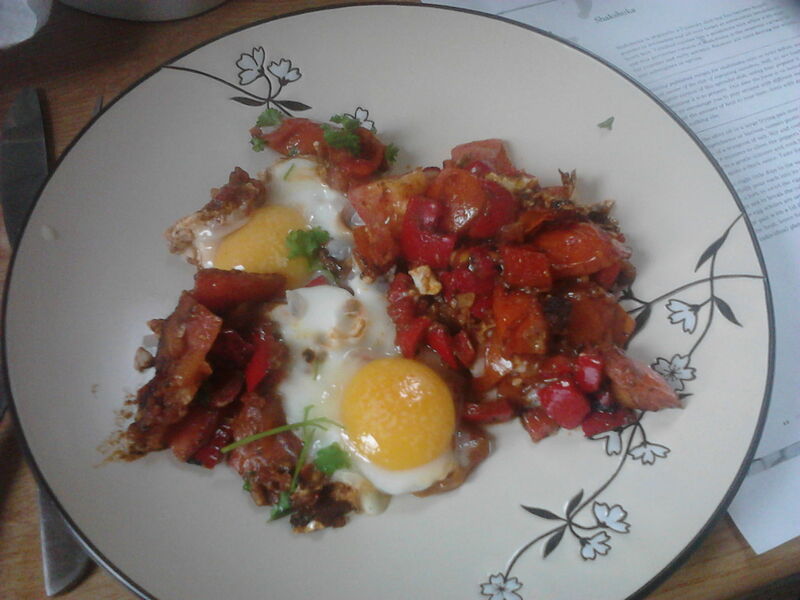 This is another Ottolenghi recipe, though I have had Shakshuka before in my local vegetarian cafe. It’s a very simple dish and doesn’t require too many ingredients. Takes about half an hour and perfect when it’s cold outside. I have scaled down to serve one. Heat your oil in large frying pan. Add the garlic, pepper, tomato puree, harissa, cumin and salt. Fry for 8 minutes on a medium heat, so that the pepper has softened. Add the tomatoes. Fry for a further 8 minutes. 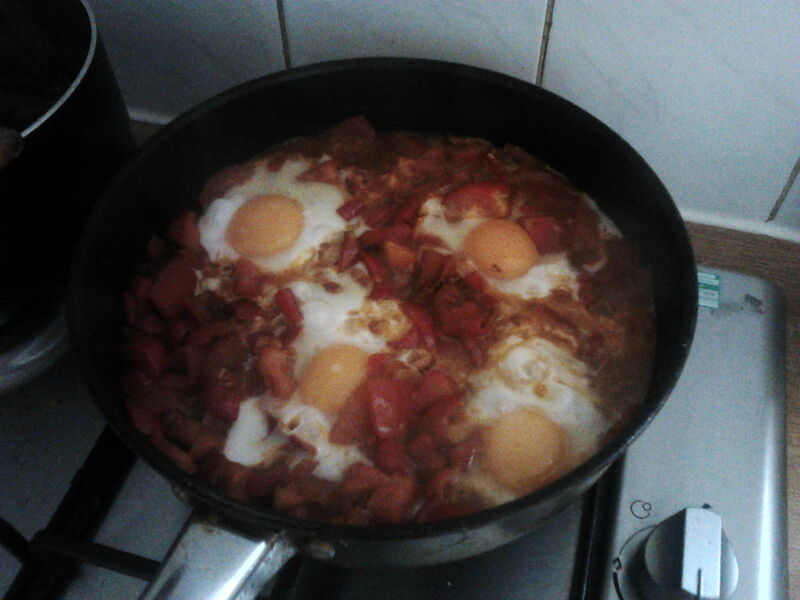 Next you need to make some ‘hollows’ in the sauce, so that you can poach the eggs in it. You can either make 4 hollows or 2, depending on whether or not you’d prefer to keep your yolks and whites separate. I don’t think it makes much difference – either way you break the eggs and let them fall into their places in the sauce. Cook for a further 8-10 minutes. When done, add chopped parsley if using. Serve with yoghurt and/or hummous. The following is a very easy and cheap recipe to make with the added bonus that it is delicious! Great gluten-free alternative to lasagne. 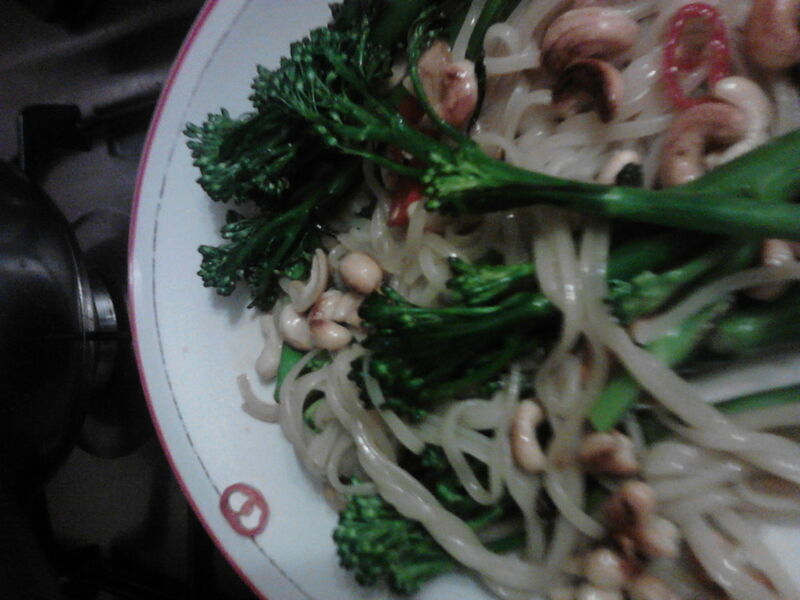 I’ve noticed that it also seems quite a good dish if I’m coming down with a cold. After chopping the aubergines, place the discs on an oiled baking or pizza tray. 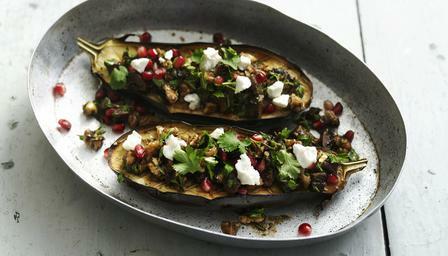 Brush the surfaces of the aubergine with a little more oil and scatter your choice of herbs on top. Bake in fan oven at 240 celsius for 10 minutes. Spread some of the tomato sauce in the bottom of a pyrex baking dish. 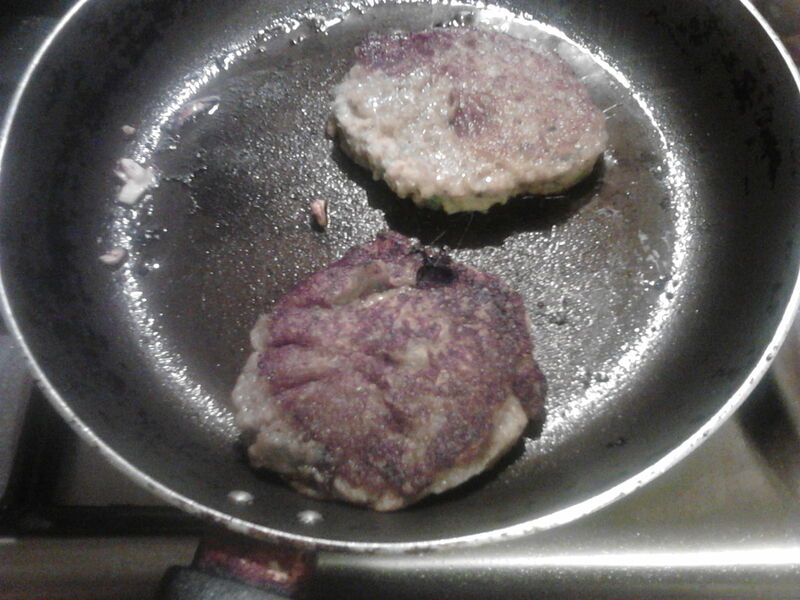 Place some of the aubergine discs on top, and then scatter with cheeses. Continue to layer in this way until you end with the last of the cheeses. Sprinkle herbs on top. Bake again for another 10-15 minutes. 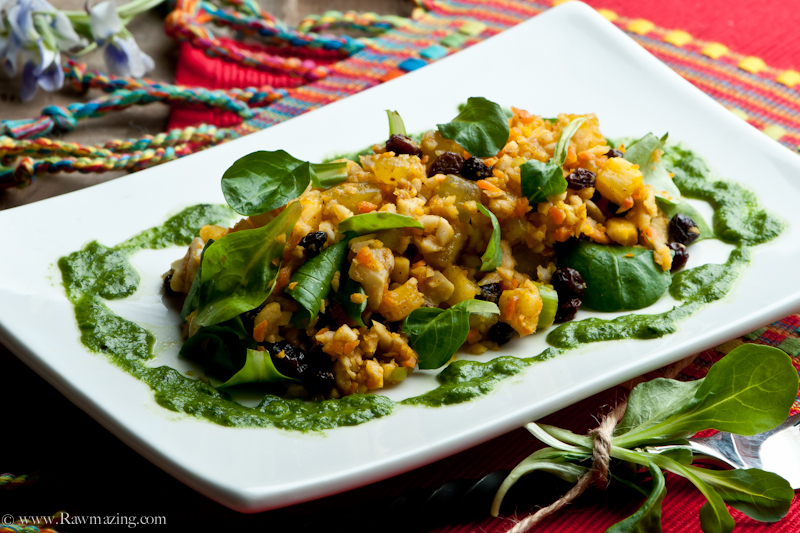 Enjoy with brown rice or quinoa, and/or green salad. 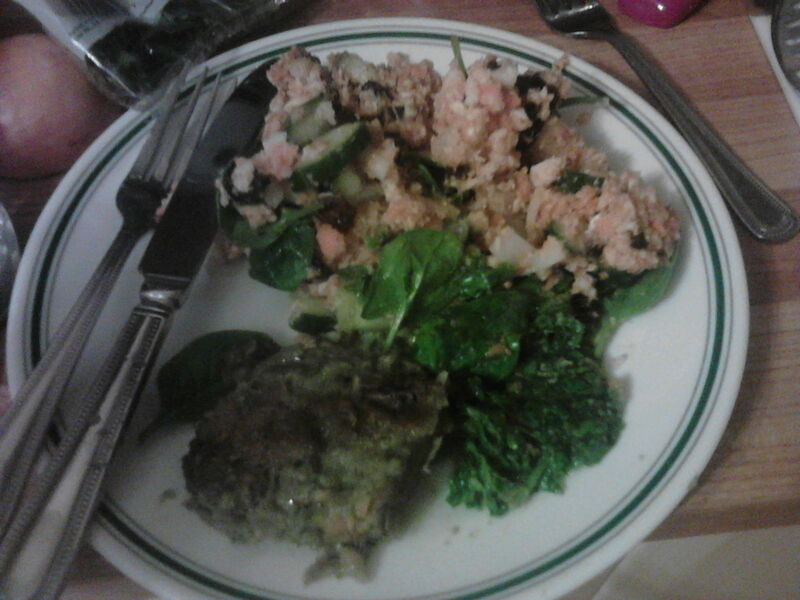 This next recipe happened by accident, as a result of me failing to properly read the recipe I was trying to follow. What was supposed to be a simplified version of Louisiana Red Beans turned into something far creamier and thicker in consistency, reminding me of the corned beef hash my mum used to make, but without the mashed potato topping. Sometimes our mistakes are good 🙂 And this meal turned out to be very hearty, almost curry-like comfort food which kept me from starving for a total of 3 days. plenty of cooked brown rice to serve. In the blender, pulse the onion, pepper, garlic and celery until you have a green puree. Cook for about 10 minutes in a large pre-heated pan. While that is cooking, rinse the beans well and pulse 1 and a half cans worth of them in the blender along with the can of tomatoes. Stir in the slushy beans and the whole beans with the vegetables and add the herbs and spices. Boil then place lid on pot, turn heat low and cook for 30 minutes, stirring every now and then. Fresh coriander makes a good garnish. Add salt and extra hot sauce to taste. 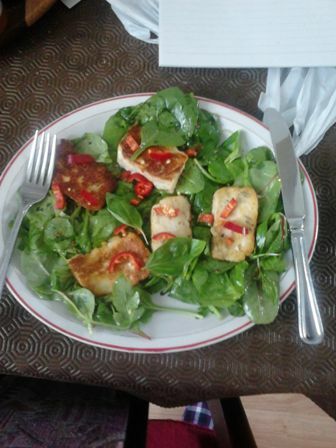 I have pinched this recipe from BBC Good Food, but that’s because it really is good food. I used toasted sesame oil for the aubergines instead of olive oil, and olive oil instead of ‘walnut pickling liquid’ and walnut oil. I also used a real chilli instead of flakes, and dried cranberries instead of pomegranate seeds. Anyway, I often have a craving for aubergines (which are full of B vitamins, manganese, copper, potassium, iron, as well as cancer-preventative flavonoids) and this combines their lovely subtle flavour with a yummy, exotic mix of fruit and spices. The recipe was written by brilliant Israeli cook Yotam Ottolenghi. Preheat the oven to 230C/450F/Gas 8. Cut both the aubergines in half lengthways and score the flesh in a criss-cross pattern. Brush the flesh liberally with the oil then sprinkle with 1½ teaspoons of salt and some freshly ground black pepper. Place on a baking tray, flesh-side up, and roast in the oven for about 40 minutes, or until the flesh is cooked through and turns a dark golden-brown. Meanwhile, make the salsa. Mix together the walnuts, walnut pickling liquid, vinegar, garlic, chilli, walnut oil, parsley and half the coriander with one teaspoon of salt. 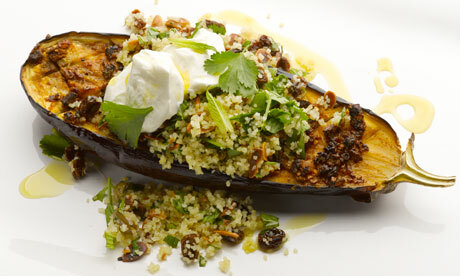 Spoon the salsa over the aubergines as soon as they come out of the oven and leave to cool completely. Just before serving, sprinkle the remaining coriander on top along with the goats’ cheese and pomegranate seeds. Fry onion in oil over a low heat for 20-30 mins, without burning. While that’s cooking, boil the water in pan and add lentils. Cook 20 mins/until tender with bite. Add rice. Cook 25-30 mins. Drain. Stir in half the onions and all the lentils. Pile rest of the onions on top. Make the dressing in a bowl. Add the salad and toss. Cut the cheese into thick slices. Fry 1-2 minutes per side until browned.